Rules are there for a reason, but there is nothing wrong with breaking them. These statements are not contradictory. That is one of the most important things to understand about the traditions of menswear. All rules have a rationale behind them. They are useful rules of thumb that become formalised over time. And they become formalised because they have practical advantages that encourage men to apply them regularly. So why is the generally recommended length for men’s trousers? Because it creates a clean line at the back of the trouser, adding to the lengthening silhouette that is the suit’s main aesthetic advantage. But, when a man is walking they have sufficient length to not flap around and expose the ankle. If the trouser were longer, it would create a puddle of folds that could ruin the silhouette of a suit, dragging the eye down and making a man look shorter. If the trouser were shorter, it would flap around the ankle and remove any elegance – probably reminding the viewer of a schoolboy in short pants. That’s why the rule, or guideline, exists. But once you know this, there is nothing wrong with breaking it. Knowing why the rule is there helps you break it well. For example, men on the European continent tend to wear their trousers shorter. They do that because they like a clean line at the front of the trouser as well as the back, and don’t mind exposing their footwear, and perhaps their socks, to more inspection. Now, if men on the continent simply wore their trousers shorter, they would encounter the aforementioned problem with flapping. But they aware of the rules and why they exist. 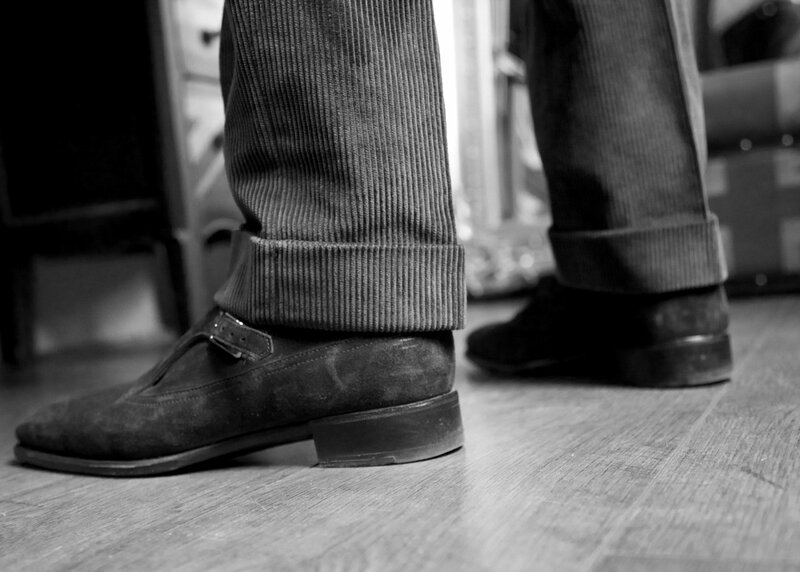 So they wear their trousers narrower as well, fitting them closer to the ankle and minimising any flapping. Personally, I tend more towards the longer length with more formal clothing like suits, and towards the latter with more casual trousers. Once you know why the rules are there, you can work out how to break them effectively. You can follow the discussion on The rules and how to break them 1: Trouser length by entering your email address in the box below. You will then receive an email every time a new comment is added. These will also contain a link to a page where you can stop the alerts, and remove all of your related data from the site. Traditionally trousers were always worn to just reach the shoe without breaking. Trouser legs were often quite wide, so flapping could probably not be avoided (maybe by using thicker fabrics). Do you know when and why this changed? Would it be acceptable for a businessman today to wear trousers the traditional way? Loekee, you are right that that was the traditional length in the 20s/30s. The flapping aspect was helped a lot by the fact that they wore much thicker materials, largely flannel and tweeds, which do not have the potential airy problems of worsted. I only like the look of the man on the far right… but his tie seems disproportionally wide, and he also seems to be wearing pleated trousers without a cuff. I don’t care much about ‘rules’ per se, but I do like clean lines and a balance of proportions.. though it does seem that ‘classic’ men’s style, strictly speaking, has truly evolved from sack suits to trim suits. I hope we don’t regress. When I go to my local tailor to have trousers hemmed he always finishes them at an angle, i.e. longer at the back than at the front. I’ve not been bold enough to question him about this (he’s been a tailor for half a century almost) but I do wonder whether this is customary? Have you ever come across this? Should I ask him to hem the trousers at a normal 90 degree angle to the legs? No Peterjan, as far as I know it’s normal to have them a touch longer at the back to create coverage at the back whilst meeting the higher part of the front of the shoe without creating too much of a break. I don’t think it’s universally true, or even generally true, that men in Europe normally wear trousers shorter. I’ve had numerous pairs made and not once have they been short. In fact I’d compare them as closer to English tailoring, which to me shares less of a tradition with American tailoring in terms of trouser style and length. I have some questions regarding trousers issue.Firstly, what is the perfect trousers length and secondly, should I get a flat-front or pleated trousers taking consideration of my height between 5’3 and 5’4 with waist of 26′ and small body frame.To find a suitable style/fit that complement my body type has been difficult for me.Hence any help/guide is highly appreciated. it’s not true that men on the continent wear trousers shorter. they do it mostly in italy, some in france and spain, but rarely in other continental countries. in german speaking countries as well as scandinavia they wear them rather too long and wider than in latin countries. Is there any chance you could give your thoughts on ideal trouser hem width/ I know it depends on the style of the suit and/or general outfit but it would be interesting to get your thoughts on this subject as it seems to be something that is quite difficult to get right! It is definitely an issue of personal choice, as it so driven by the style of the suit. I usually go for 16 or 17 inches, but some tailors go for 18 inches. If going to an established tailor, I would let them choose. If you want to choose, perhaps measure a pair of trousers you like. It will also slightly depend on your shoe size. Can you help? I wear long socks and have started wearing shorter, slimer trousers. This combination has the unfortunate consequence of causing the trousers to catch on the stop of the sock, thus bunch at the knee and exaggerating the shortness of the trousers. 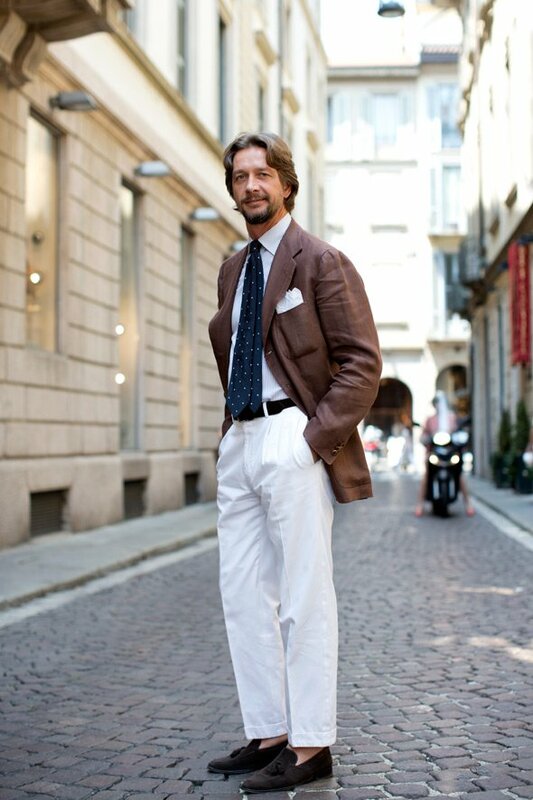 Gianni from Sartoria Vergallo suggested a band of lining at the back of the trousers at top-of-the-sock height, which has helped, but not eliminated the problem. Do you have any further suggestions? Not really, other than Gianni’s idea and perhaps wearing cotton or cotton/silk socks which will have less friction than wool. Unfortunately long socks were and are largely worn by those whose trousers are rather wider than that. Surely wearing shorter trousers necessitates the wearing of long socks in order to avoid the dreaded bare-calf?! Thanks for your reply Simon. I had some Kilgour RTW slimmed slightly to 16 inches in the end and am pleased with the result. They were previously 18 inches and I felt they had a slightly ‘bootcut’ look to them which was horrible! 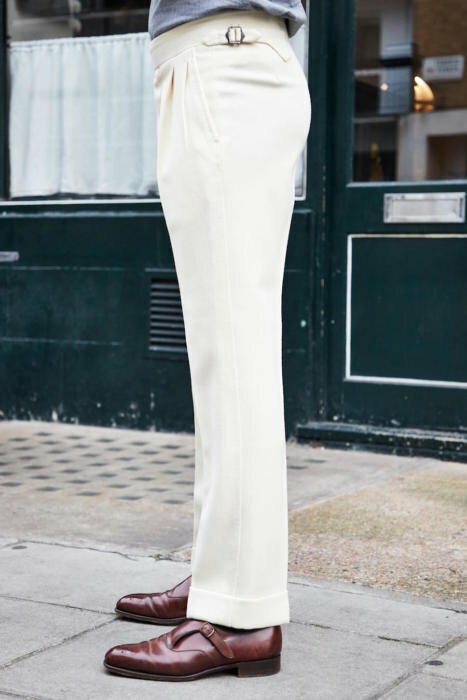 Many ‘chino’ type trousers seem to go to 15 or even 14 inches now which I think looks a bit extreme on a suit if you are trying to achieve a classic look. greetings Simon; this is my first post and a question that I’m struggling with; I’m an attorney in the states and an avid fan of the site since our tastes are very similar. i’ve never been a fan of turn-ups/cuffs on trousers but lately they are growing on me, especially with the heavier fabric found in last seasons rota, edits, and stoffa trousers. what are your thoughts on the proper size of the turn-up/cuff? sometimes the trousers are too slim in the back for anything more than 1.5inches but i like the heft and size of 2 inch cuffs. What is the prefect sewing / Stitch for the cuff part of a trouser?